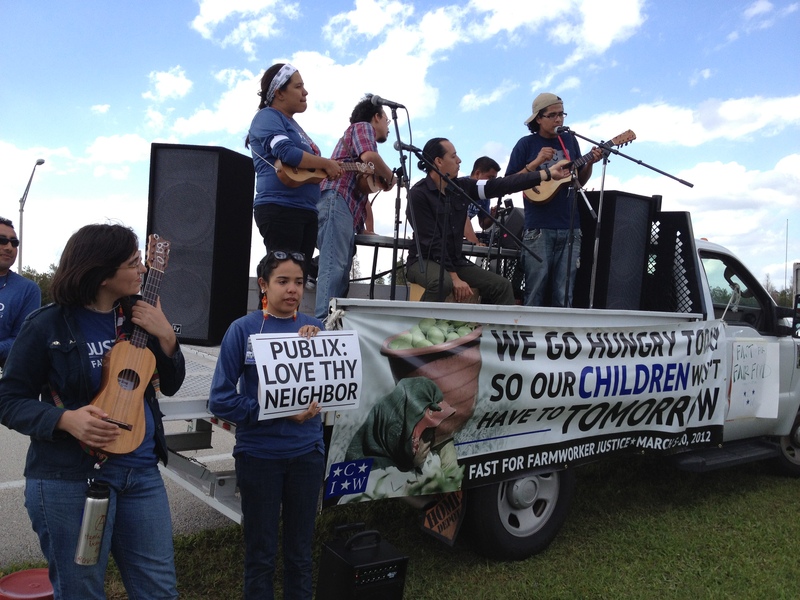 Click here to ask Publix to talk with the farmworkers and sign the Fair Food Agreement. Fasters outside the Publix grocery store at a Wednesday night vigil wait for the interfaith delegation to emerge and share whether they succeeded in speaking with the manager. That short verse from Romans came to me last night after the Candlelight Vigil that closed Day Three of the Fair Food Fast in Lakeland, FL, corporate home of Publix. We were gathered on the corner of the street where a Publix grocery stores sits in a comfortable shopping center. (We were prohibited from standing on the private property of the shopping center). Rabbi Brian Schuldenfrei of Bet Shira in Miami had offered words of encouragement to those of us fasting. He shared the story of Esther and the powerful witness her fast made in ancient Judah. After our vigil, Rabbi Schuldenfrei suggested we take the “light” to the Publix store and express the hope that the manager would convey our collective desire for conversation with corporate executives at Publix about the legitimate concerns of the farmworkers. A small interfaith delegation led by the Rabbi walked to the entrance of Publix and was met by the store manager and several other Publix employees. We were not allowed to enter the store. The Rabbi extended his hand and introduced himself to a Publix employee, not the manager, who had assumed control of the encounter and he refused to shake the Rabbi’s hand or offer his name. He interrupted the conversation and ordered us to leave the grounds. Students sing and bring joy to fasters, while also offering a musical message to Publix. To be accurate, it was not a conversation. No one from Publix said anything to us after the manager identified himself by name. It was a chilling encounter. While our visit was spontaneous, it was in good spirit, encouraged as we were by our time of prayer and singing. The Coalition of Immokolee Workers has been trying to engage Publix in conversation since 2007 by letter and since 2009 by a variety of public actions. 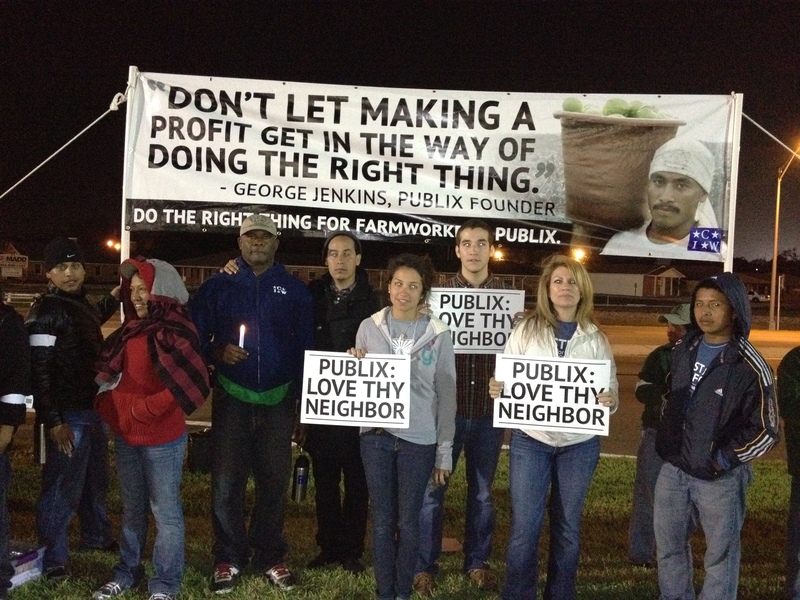 This week-long fast is the latest attempt to stir the conscience of Publix toward conversation about fair wages and the Fair Food Program. After last night’s encounter I understand much better what a long hard road the farmworkers have traveled. I’ll send another update tomorrow.